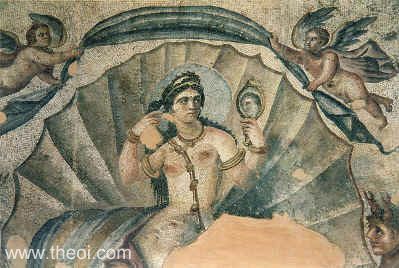 The goddess Aphrodite (Roman Venus) is borne across the sea in a cockle-shell by a pair of Ichthyocentaurs (fish-tailed centaurs) following her birth from the sea-foam. She is attended by two Erotes (Roman Cupids) who carry a billowing shawl. Traditionally the pair were Eros (Love) and Himeros (Desire). The goddess is crowned with a shining aureole and gazes at her reflection in a mirror.